Let’s make it short: I know I didn’t post anything for the last three months. But I’ve got something for you that will definitely make you forgive me. And not just any cupcakes! 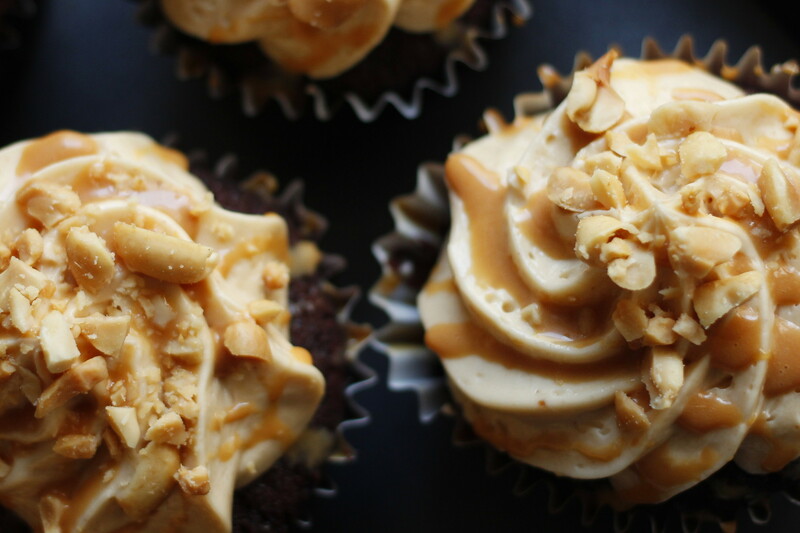 Incredibly moist Devil’s food cupcakes with the best thing I ever made (until now) on top: salty peanut butter Swiss Meringue Buttercream. I’ve already made these twice, within two days. Because they’re simply ridiculously good. I didn’t even have to convince my ascetic boyfriend to try them, because he’s completely NUTS (get it? hee hee.) about anything Snickers. He’s a Snickers maniac. Probably the only naughty thing (and Pico-Balla) on his diet plan. And he loved them! This in particular makes me even happier about these cupcakes. I hadn’t tried Swiss Meringue Buttercream until shortly before I first made these, as I always considered it way too fancy and complicated for me to make. Glob, what a fool I was! 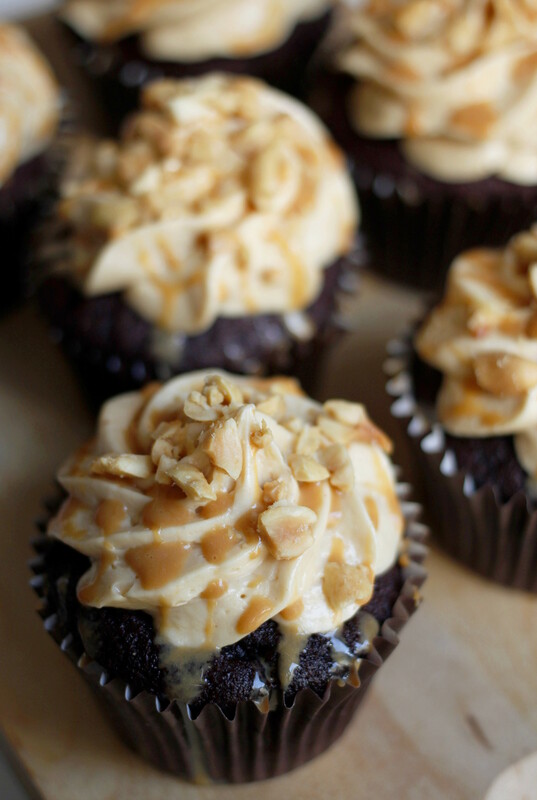 SMB is seriously the best thing you can put on top of a cupcake. And the possibilities! You can put anything in there. And every version tastes better than the one before. 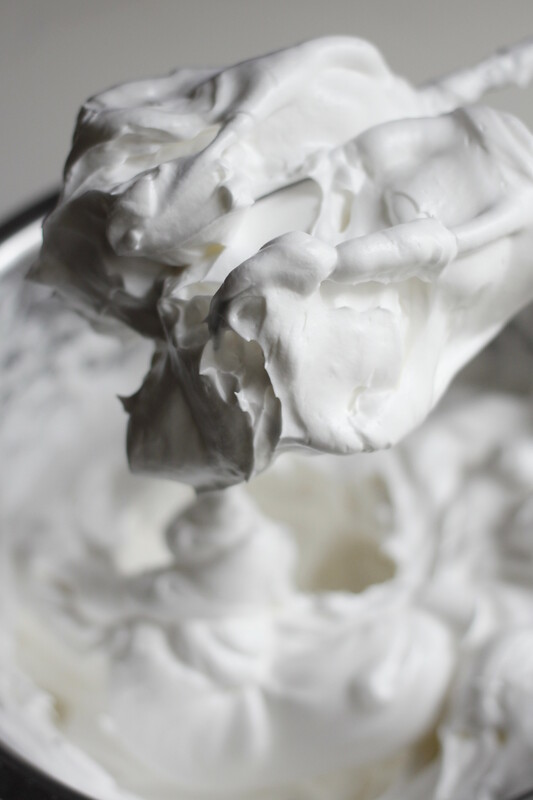 If you haven’t made any meringue buttercream before, too and want to convert to a whole new world of cupcake (and cake) toppings, pleeeaaase visit Sweetapolita’s guide to Swiss Meringue Buttercream. Do it. And then make that stuff. It will be one of the best decisions of your life. As a base I made Martha’s Devil’s Food Cupcakes with sour cream. 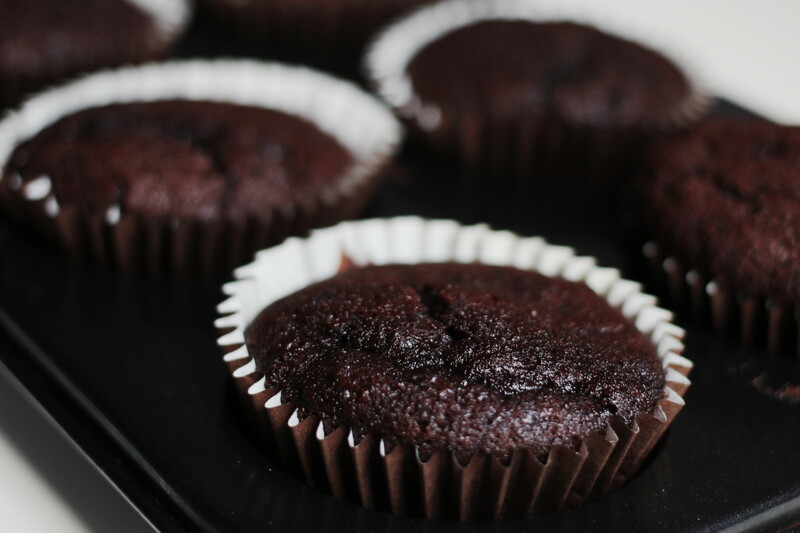 They are great: very moist and chocolatey but also fluffy and not overly sweet, and now my go-to recipe anytime it calls for Devil’s food or chocolate cupcakes in general. Now to make the SMB, you need to make sure everything you work with is completely fat-free, as always when working with egg whites. Separate the eggs carefully so that no yolk sneaks into the whites and wipe your bowl, whisks and spatula with lemon juice or vinegar. Otherwise your meringue will end up flat and disappointing, and you will not be able to work with it. Next, you set up a bain-marie. Fill a sauce pan with water (about 2-3 cm high, depending on your bowl) and bring it to a simmer. Place a bowl on top – I always use metal bowls – so that it lies safely on top of the sauce pan and doesn’t touch the water. This is essential as you don’t want to end up with cooked egg whites. You’d best try different sizes of bowls and sauce pans before you start. The water mustn’t boil, it just needs to simmer, so that the egg whites are heated slowly. 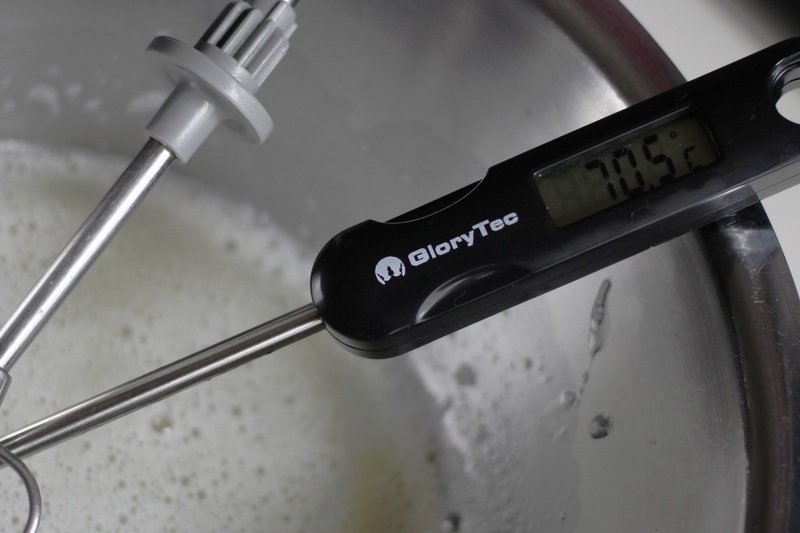 For best results use a candy thermometer. I’ve always been reluctant to purchase one because I normally don’t like having tools lying around that are only used twice a year (but everything changes when you get older… haha). But I sincerely suggest you do it, if you don’t already have one. You can also use it for tempering chocolate. And many other things, probably. Gently whisk the egg whites and sugar until the sugar dissolves, remove the bowl from the sauce pan when the egg whites reach 70°C (160°F). 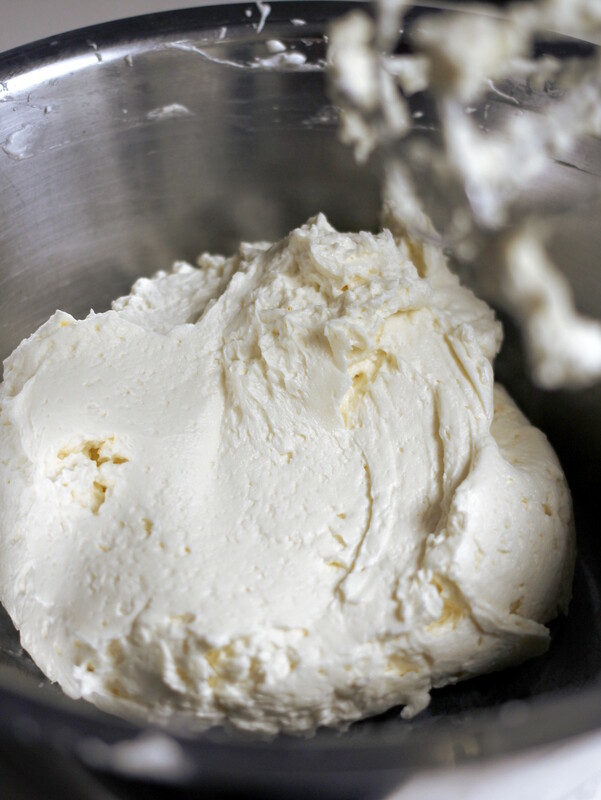 Then take the butter out of the fridge and cut it into cubes so that it softens a bit until your meringue is ready. I’m sorry I didn’t get 70° precisely. I really tried. Now it’s time to beat. The egg whites. Start on low and then continue on medium and high until the bottom and sides of the bowl feel neutral to the touch. This is important because otherwise the butter will get too soft and your SMB will get soupy (which you can fix, of course, but who wants to spend 10 extra minutes in the kitchen?! Surely not us.). So beat and beat until your meringue is nice and stiff and the bowl isn’t warm anymore. Then you add the butter, about three cubes at a time, and beat until fully incorporated. Then you add more and so on. You can read about the issues that might appear in Rosie’s post linked above. Basically you just need to beat until it all comes together! This might take a while, but the result is heavenly. 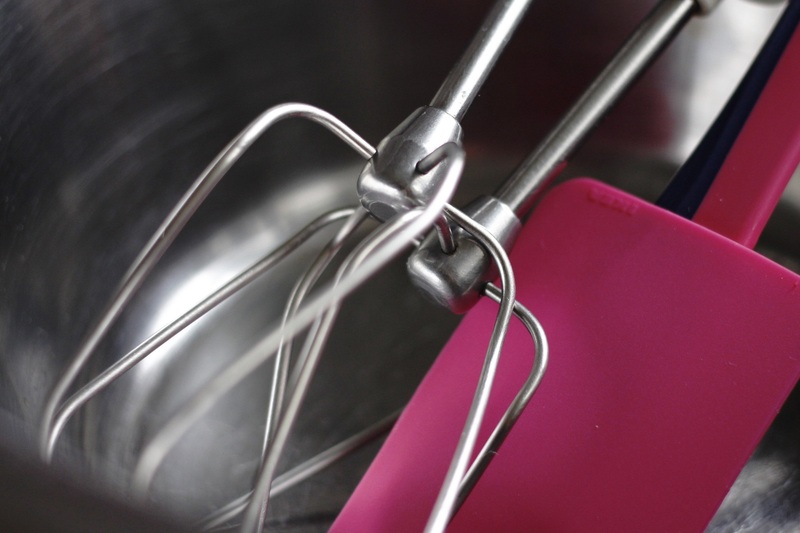 Stir and smooth the buttercream with a spatula, et voilà! Now, I didn’t leave my SMB like this. 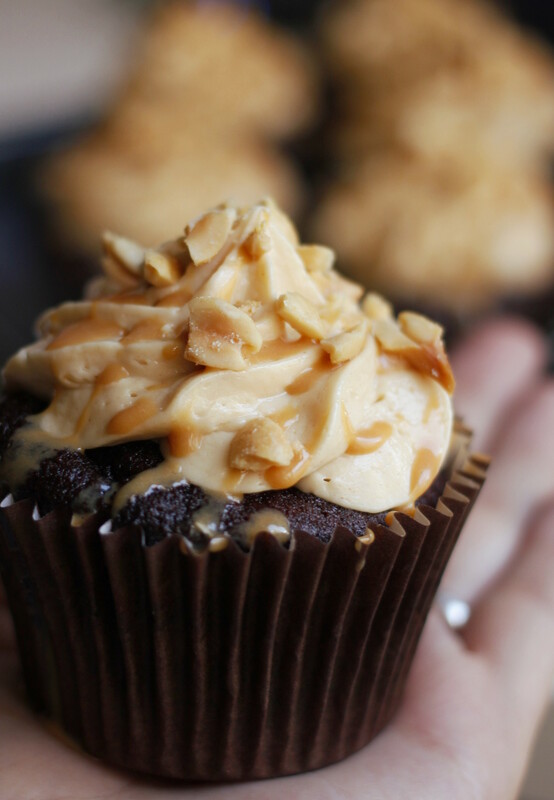 I performed a highly complex culinary process in order to get the right topping for my Snickers cupcakes. I added peanut butter. 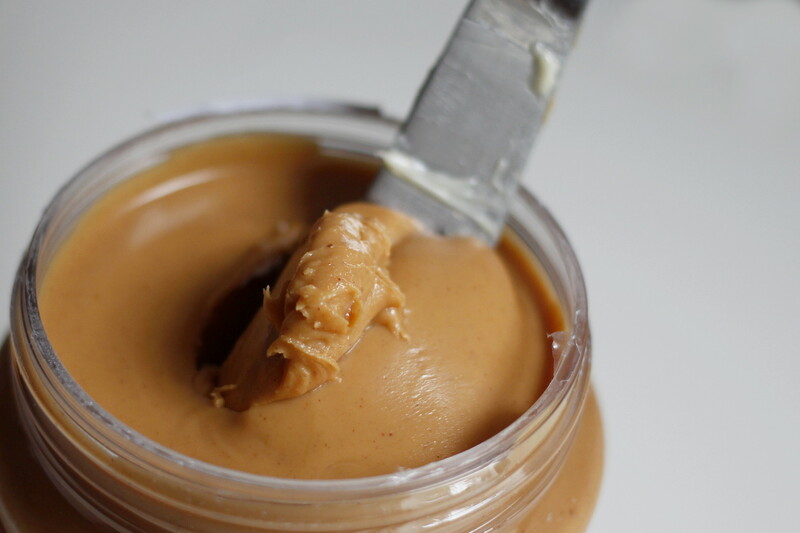 Is there anything more satisfying than being the first one to dip your knife into an untouched, virgin, innocent surface of peanut butter or nutella? Boing. The ratio is up to you, though you have to be careful to leave the buttercream thick enough for holding its shape when piped. And don’t forget the salt. There we have it! The best buttercream I have tasted in my life. If I hadn’t known there were 12 cupcakes to frost, I’d have eaten it all just like this. 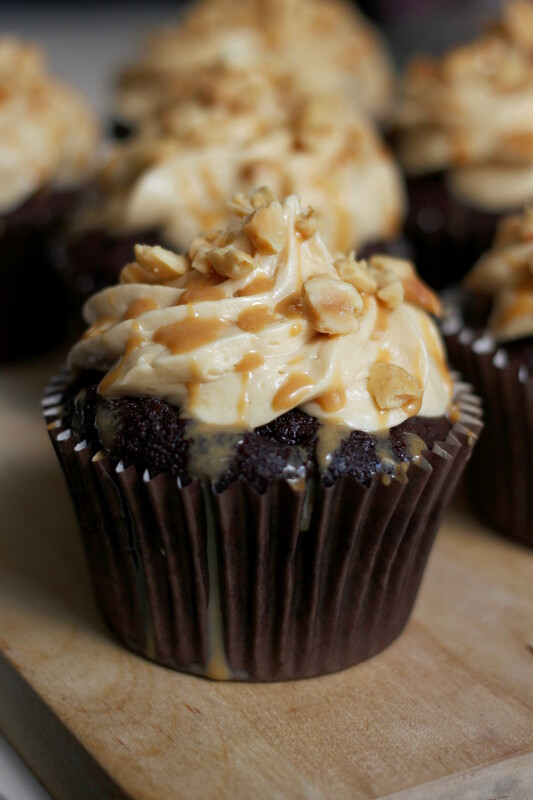 Pipe it onto your chocolate cupcakes, generously pour caramel sauce over it (I notice now that I look at the pictures that I used way too little caramel. This is a shame. I’m sorry! 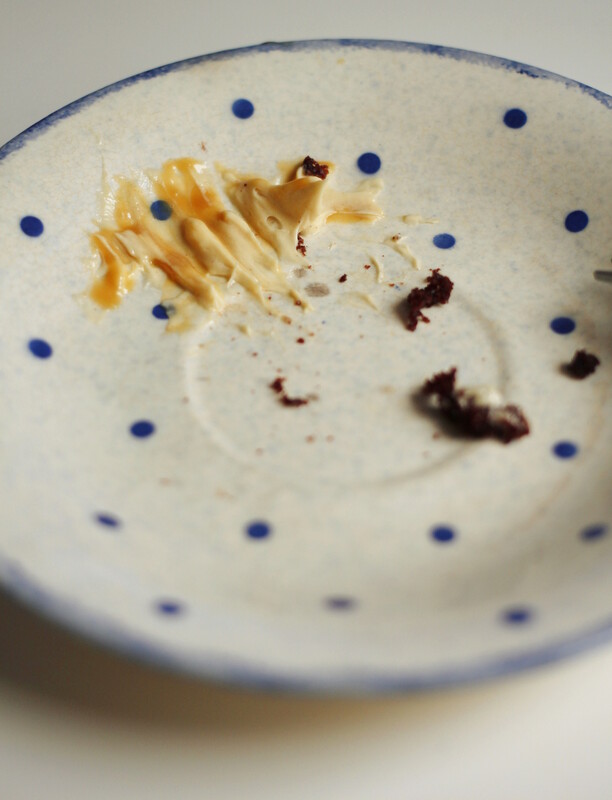 It would have looked and tasted STILL nicer…) and sprinkle some slightly crushed salted peanuts on top. Aaand from on top, because they’re just too beautiful! Yumyumyum. 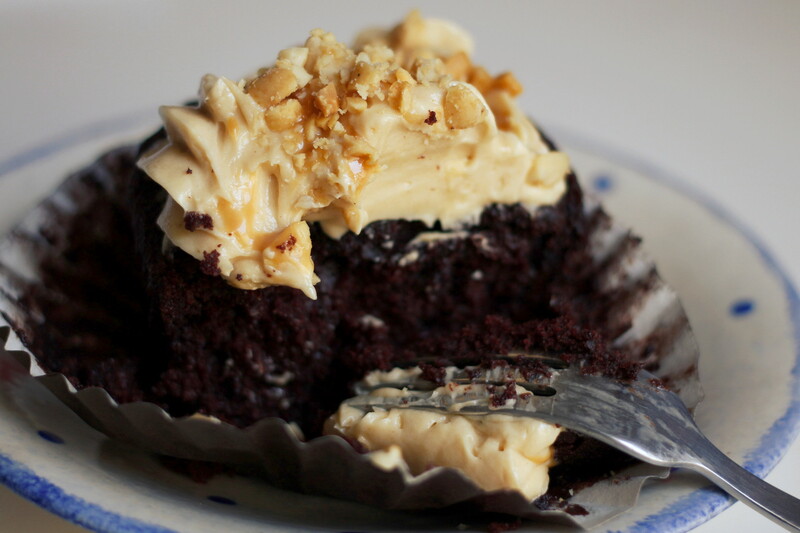 Moist, chocolatey, fluffy, sweet, peanutty, salty, crunchy, creamy. Perfection in a muffin liner. You’ll get about 4 cupcakes frosted with 1 egg white. 30g sugar and 50g butter (and 20g peanut butter) per egg white. So simple! 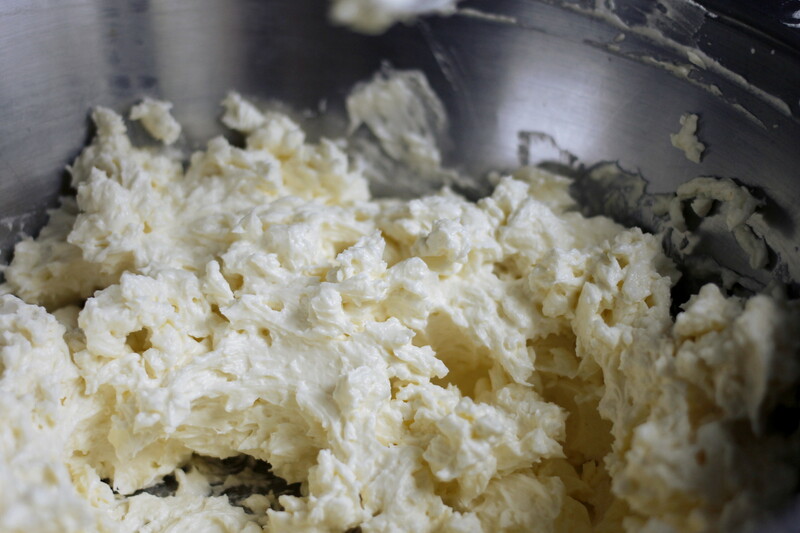 Slowly heat egg whites and sugar in a bain marie, whisk gently, until they reach 70°C (160°F). Remove the bowl from the sauce pan, beat the egg whites until the bowl feels neutral to the touch (not warm anymore) and the meringue is stiff. Slowly add the butter while beating, incorporating every cube completely. 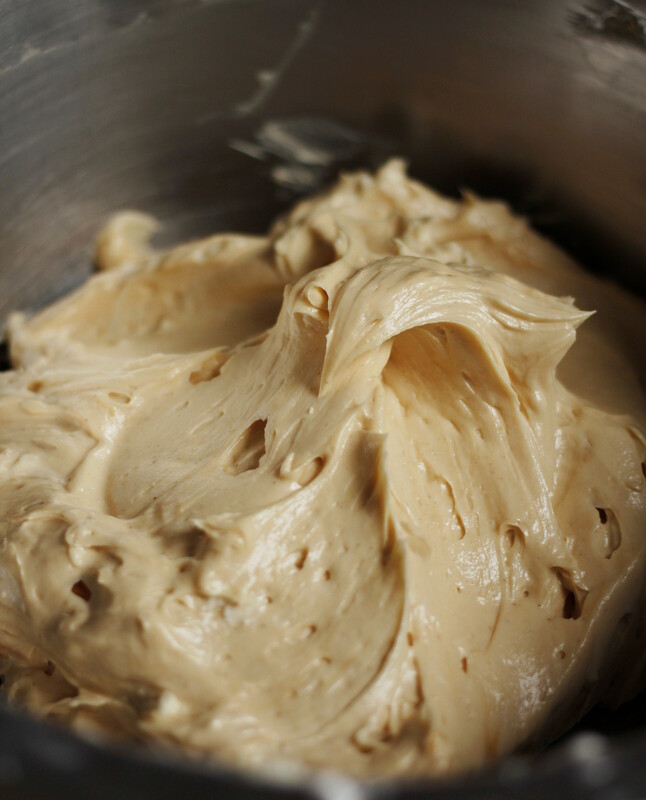 Beat until a nice, satiny, smooth buttercream forms. 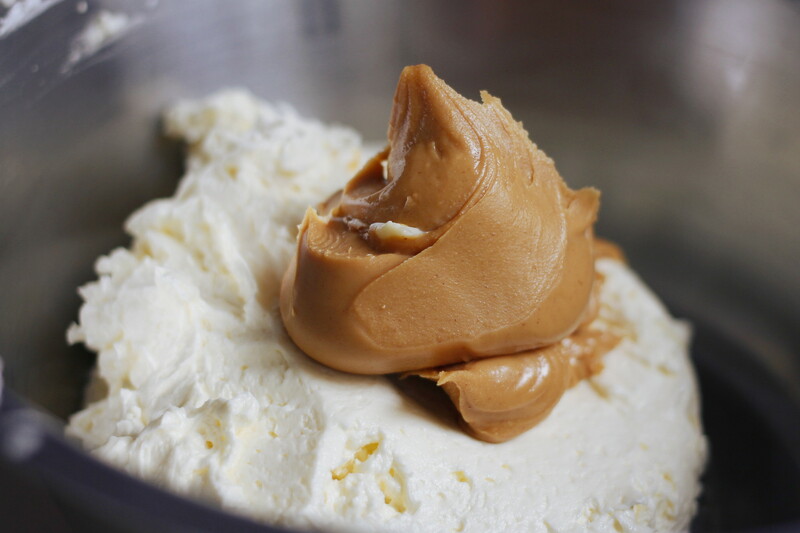 Add the peanutbutter and salt. 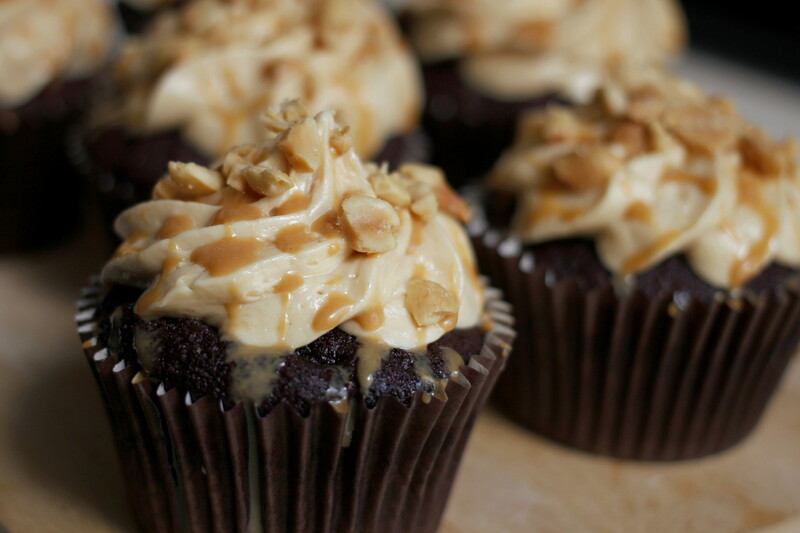 Pipe buttercream onto cupcakes, pour caramel sauce on top and sprinkle with crushed peanuts. hihi danke! :) doch, mach mal! ist viel leckerer und billiger!